Recommended clients to work with Kopano are DeskApp, WebApp and ActiveSync/Z-Push-clients. A very special Z-Push-client is Microsoft Outlook as we enhance this clients functionality by the Kopano Outlook Extension (KOE). The newest version (now available as 1.4 RC) introduces a few sought-after UX improvements: synchronisation state indicator, additional (re-)synchronisation control and an improved handling of private items. For this release we have focused on improving the user experience by giving the user a visual indicator on how far along his client is in downloading changes from the server. This comes in especially handy when setting up KOE for the first time, since Outlook otherwise does not give any indication besides “downloading from the server” and “updating local folder”. To make this feature possible a small addition to the Z-Push Soap API was necessary and therefore it only works when at least Z-Push version 2.3.7 beta is installed on the server. 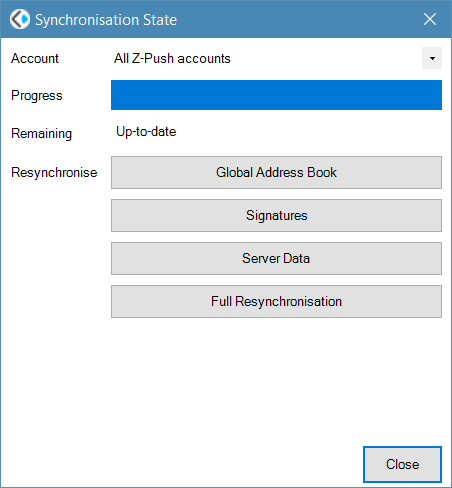 The new visual indicator also serves as the button to open the new “Synchronisation State” dialogue, which allows users to more easily trigger a resync of locally stored data, such as connection metadata (Z-Push version, etc), locally stored signatures, the global address book (GAB) or the store in general. This last option also allows to easily resync your local data, while still keeping already setup shared stores. Another new feature that users of Z-Push 2.3.7 can now make use of is an updated behavior for private items in shared calendar folders. While previous version of Z-Push simply ignored these private items, they are now synced as a placeholder item instead of the actual appointment. Users of KOE 1.4 now additionally get a popup notification if they try to modify such a placeholder item. With the wider adoption of KOE we also encountered an error in the configurable shared calendar notifications of version 1.3. This functionality has now been refactored and made more resistant to failures on updates, so that from now on only folders that should receive reminders, actually popup in the reminders. 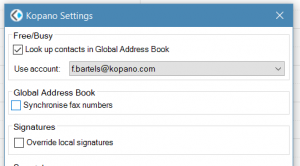 Three notable smaller features are the newly added ability to request delivery receipts through the Outlook ActiveSync account and the added synchronisation of BCC information for sent items, as well as the newly added ability to discard fax numbers from the GAB. The extension, as it is downloadable now is already “feature complete” for the upcoming 1.4 version of KOE. Though to allow a wide adoption of the RC we decided to disable the a new feature to detect a stalled sync by default. Interested users can use the “Plugin Debugger” which can be found in the KOE install directory to enable the “CheckSyncStall” feature to let KOE offer to perform a full resync on such a profile. In addition to this we are currently busy overhauling our KOE documentation. The goal is to separate the current manual into a new “user” and an extended “administrator” part. The goal of this separation is to make the functionality of KOE better approachable to users that have already worked with other Outlook add-ins. For a full overview of the changes, please refer to the changelog. What else is still missing for you in KOE? 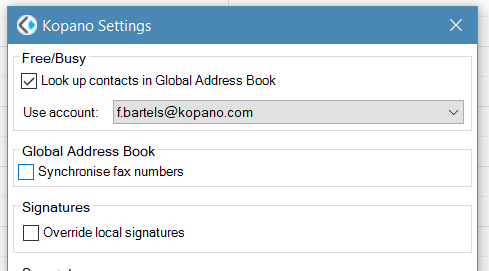 Or do you maybe want a deeper integration of Kopano WebMeetings inside of Outlook? We are looking forward to your feedback, for example through our new Kopano Forum. The Kopano OL Extension can be downloaded from the Kopano portal. You can find more detailed setup instructions in the Kopano Knowledge Base. To use all functionality of KOE you need at least Z-Push 2.3.7, we recommend to use the Z-Push package repositories to easily stay up to date.